Posted by Marsha Goodale on 2012/11/13 in Articles, Reservations, Slideshow | Comments Off on Hear Ye! Hear Ye! Come to our BIG Breakfast! Home » Articles » Hear Ye! Hear Ye! Come to our BIG Breakfast! Try the “Billy Bunter” for a taste of the BIG Breakfast! Breakfast is 9:00 am and seated by 10:45 am, reservations are suggested. We don’t crack an egg until the order comes down. Everything is made by scratch so expect to wait–but it is worth it! The Windsor is now offering breakfast on Saturday, & Sunday! Breakfast hours are from 9:00 am until 11:00 am SHARP on Saturday and Sunday. You must be seated inside no later than 10:45 am to get your breakfast order! We have a small kitchen and our eggs don’t crack until the ticket hits the line. If you are looking for breakfast cooked under five minutes with instant egg– just add water there are plenty of fast food options around town. We strive for quality using fresh ingredients made to order when the ticket hits our line. Our kitchen works hard to get every order out to the customer as they want it, that’s why the breakfast has become so popular. Sorry, we would like to make everyone happy– but we can’t make exceptions for those customers that can’t make it before 10:45 am expecting the Big Breakfast–it affects our lunch trade, and we have to change over our kitchen. In a small kitchen we must be able to turn our space quickly in order to have lunch ready. Our lunch menu resumes at 11:10 am until 4:00 pm! Catch the awesome review of our BIG BREAKFAST with Rori Travels Florida! New weekday hours: 11:00 am until 4:00 pm, the kitchen closes at 3:45 pm! If you have a reservation and you think you may be late call to let us know so that we can still serve you! We are open evenings for special events, so check our website for updates. We are closed on Thanksgiving day, Christmas day, and New Years Day. We are also closed on Wednesday. Breakfast fit for a King, or at least a Royal subject….English style eggs! Try new dishes such as the Benedict Arnold Eggs, My Lord Essex Eggs, an Oxford Omelette, or the Billy Bunter Breakfast. For a heartier appetite try Shakespeare’s Skillet, or the Queen’s Quiche. If you are watching your waistline you may fancy the Sir Francis Drake Fruit plate. 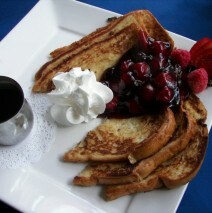 If it’s sweets you’re after you may want to indulge in the Pancakes or the Bonaparte French Toast. Eating light? Simply choose from one of many breakfast sides to go with your Cream Tea. Come in and try out the latest additions to the Menu today! Friday breakfast from 9:00am.-11:00am is open for bus tours and business groups or large parties only. Please contact 352-735-2551 for reservations for your event.